Joe Simpson and his climbing partner, Simon Yates, had just reached the top of a 21,000-foot peak in the Andes when disaster struck. 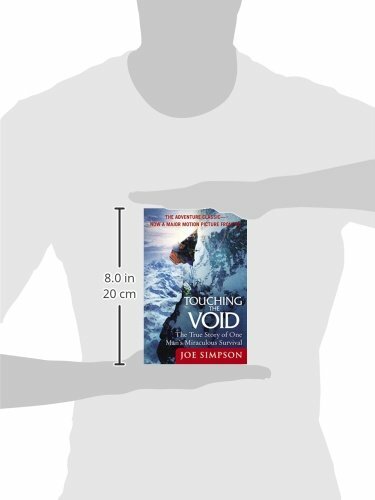 Simpson plunged off the vertical face of an ice ledge, breaking his leg. In the hours that followed, darkness fell and a blizzard raged as Yates tried to lower his friend to safety. Finally, Yates was forced to cut the rope, moments before he would have been pulled to his own death. The next three days were an impossibly grueling ordeal for both men. Yates, certain that Simpson was dead, returned to base camp consumed with grief and guilt over abandoning him. Miraculously, Simpson had survived the fall, but crippled, starving, and severely frostbitten was trapped in a deep crevasse. 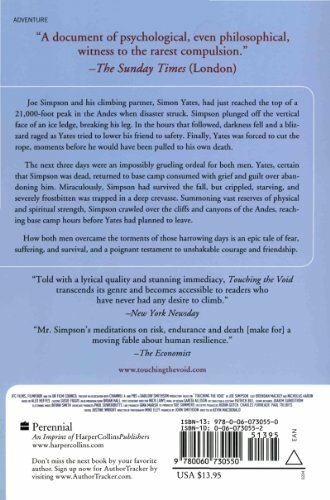 Summoning vast reserves of physical and spiritual strength, Simpson crawled over the cliffs and canyons of the Andes, reaching base camp hours before Yates had planned to leave. 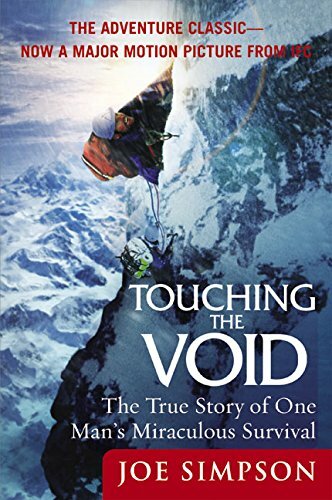 How both men overcame the torments of those harrowing days is an epic tale of fear, suffering, and survival, and a poignant testament to unshakable courage and friendship.Great product!